Sand Wars – From SpongePedia, the biggest SpongeBob-wiki in the world! 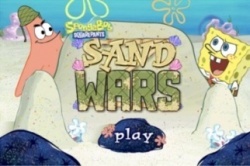 Sand Wars is an online SpongeBob game that is based on the episode: Sand Castles in the Sand. In this game, SpongeBob and Patrick are fighting with sand. The player is playing SpongeBob and has to destroy all of Patrick's sand mounds before he destroys SpongeBob's. This page was last modified on 12 October 2013, at 19:21.